State Energy Program staff members Jason Berry and Bo White completing a 20-meter tower installation in Torrey, Utah, near Capitol Reef National Park. One of the occupational hazards of working in the renewable energy field is taking calls from landowners who say they want to build a wind farm. Some are practical business people and some are dreamers, but one thing they typically have in common is a lack of hard data about the wind in their area. Since 2001, the State Energy Program (SEP) has managed the Anemometer Loan Program to help Utahns measure and assess their wind resources. The program also helps the state to develop a better picture of where we can use the wind to generate emission-free and renewable electricity. SEP owns thirteen 20-meter-tall guy-wired towers that are used to mount anemometers and other instruments for measuring wind speed and direction. Twenty-meter towers are lent to landowners at no cost and are intended as a first-cut assessment of wind data at a particular site. Landowners apply to SEP and are selected based upon criteria that include local topography, elevation, and wind model projections. Data are collected from each site for at least one year to determine not only average wind speed, but also daily and seasonal wind patterns. These data can then be used to assess a site’s suitability for a small wind turbine for personal or local use. They can also suggest whether additional assessment is warranted. SEP also owns eight 50-meter towers that can be used to determine whether truly largescale wind power development in an area is possible. SEP lends several of these towers each year; however, recipients are responsible for the cost of commissioning and decommissioning. SEP also places a limited number of 50-meter towers on state-owned lands that show promise for wind development. In addition to other factors, siting of SEP’s larger towers is based on proximity to electrical transmission lines. Some of the best potential winds in Utah are found far from transmission lines (e.g., in the Uinta Mountains), making the feasibility of developing wind farms in such areas cost-prohibitive. In 2003, SEP’s wind development efforts were aided by the commissioning of a new wind resource map based upon meteorological and computer modeling. This map assists both SEP and prospective wind developers in targeting areas of likely strong wind. Since it is impossible to obtain anemometer data for all points in the state, this map provides useful “best estimates” of wind resources for all areas of Utah. Based on this and the availability of transmission, SEP has recently sited 50-meter towers near the Cricket and Raft River Mountains. Two 50-meter and two 20- meter towers are also currently assessing wind resources in Tooele County, where the wind resource map suggests a viable wind resource near both transmission lines and electrical load centers. Sometimes, however, good wind resource guidance comes from local residents who are sure that the wind blows through their valley faster than through others. Data from SEP 20-meter towers indicate a potential wind development area near Monticello in San Juan County, an area that is not highlighted on the computer-generated wind resource map. 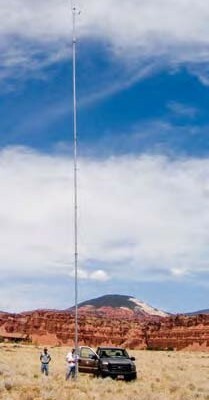 With or without computer projections, hard data from anemometer towers are needed to verify the accuracy of a model’s estimates or the observations of a wind-blown rancher. To date, Utah has no large wind farms, though estimates suggest that over 1,000 megawatts of wind capacity (equivalent to a large coal power plant) is feasible. Through SEP’s efforts to gather and publish wind data from throughout the state, the UGS is helping Utah to move forward to the day when several large wind farms will provide electricity to its residents. The most up-to-date picture of Utah’s wind resources – including wind resource maps, a summary map of the anemometer loan program, and data from each anemometer site – can be found at http://geology.utah. gov/sep/wind/index.htm.